NEW YORK (AP) — The NFL called in a former FBI director to examine how it pursued and handled evidence in the Ray Rice domestic violence case as pressure increased for the league to be more transparent about its original investigation. The move late Wednesday came hours after The Associated Press reported that a law enforcement officer said he sent an NFL executive a video in April that showed Rice striking his then-fiancee at a casino. Goodell has maintained that no one in the NFL saw the video until it was released by TMZ Sports Monday. Women’s organizations, members of Congress and players have called for more detail about the NFL’s handling of the Rice case. The criticism intensified after the law enforcement official’s account. Goodell turned to Robert S. Mueller III, who was the director of the FBI for 12 years, to lead the inquiry. The probe will be overseen by owners John Mara of the New York Giants and Art Rooney of the Pittsburgh Steelers, two of Goodell’s strongest supporters. Both are members of key NFL committees and have closely advised Goodell throughout his tenure. The NFL called the probe independent, and did not discuss how the owners will work with Mueller. But there could be an appearance of conflict: Mara has already indicated he doesn’t think Goodell’s job should be in jeopardy. The law firm where Mueller is now a partner, WilmerHale, is familiar with the NFL. The firm has represented Washington Redskins owner Daniel Snyder, and several former members of the firm have taken positions with NFL teams. The official says he had no further communication with any NFL employee and can’t confirm anyone watched the video. The person said he was unauthorized to release the video but shared it unsolicited, because he wanted the NFL to have it before deciding on Rice’s punishment. The NFL has said it asked for the video from law enforcement, but was denied. The video shows Ravens running back Rice and Janay Palmer — now Janay Rice — shouting obscenities at each other, and she appears to spit at Rice right before he throws a brutal punch. Rice had been charged with felony aggravated assault, but in May he was accepted into a pretrial intervention program that allowed him to avoid jail time. That could lead to the charge being purged from his record. He was cut from the Ravens and suspended by the league indefinitely on Monday after TMZ posted video of the punch. Questions about the league’s handling of the case have come from all over. Saints quarterback Drew Brees, a former member of the players’ union executive committee, questioned the league’s accountability. Brees compared it to the Saints’ bounty program in which players, coaches and the general manager were suspended and the organization was fined. Goodell has led the league through several controversies. While league revenues have grown to the $10 billion range, the NFL went through a four-month player lockout in 2011; a lockout of officials in 2012; the Saints’ bounties; a bullying scandal on the Dolphins; and the Patriots spying on an opponent. He’s weathered those situations relatively well, in part because the owners certainly like seeing such profits, but also because of his leadership. 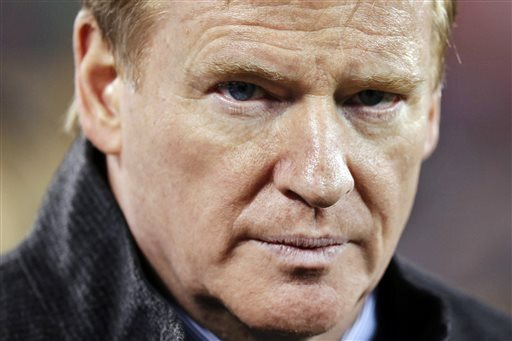 Under his watch, the NFL has clamped down on drug use and player misconduct. Goodell has not been afraid to discipline teams and owners for on- or off-field misconduct, as he did with heavy fines for the Patriots, Saints and, most recently, the Colts. But the Rice case has shaken America’s most popular sport, with fans talking more about domestic abuse than games. The Ravens play the rival Steelers in Baltimore Thursday night on national TV, but all the talk will be about the Rice case. Despite the pressure, Goodell’s job is secure, said Marc Ganis, president of Chicago-based consulting firm SportsCorp and a confidant of many NFL owners. “Roger Goodell is the best leader of any sports league on the planet today,” Ganis said. “The NFL that he runs is managed better than any sports league — ever. The people that know this best are those who pay his contract, the owners. AP Pro Sports Writers Tom Canavan and Brett Martel contributed to this story. Can This Offseason Get Any Worse for the Eagles?